Tribal members have heard of the Indian Mission, but few know or take time to understand the history of the church at the center of it. The church was established in 1878. The Ho-Chunk United Church of Christ is member of the Northwest Association of Wisconsin Conference. It’s the only Native American church in the conference. At the Northwest Association’s 2018 annual meeting, a few Mission church members shared their views, observations and concerns to their fellow members. Their Pastor David McBride, who said the church wanted to address “white privilege” questions, but thought it was better to invite the Ho-Chunk, introduced the Ho-Chunk tribal members. First, to present was Youth Delegate Lexi Fay. She wrote a paper requesting prayers for tribal members and close friends who are dealing with drug and alcohol addiction. Fay is a 17-year-old Black River Falls high school senior. She plans to attend technical college in Black River Falls after her high school graduation, eventually transferring to a college in Florida. “I want to be a psychiatrist because I just really want to help people with depression, anixiety, OCD, etc. I want them to know they aren’t alone in the world,” Fay said. The youth are getting involved in meth, heroin, cocaine, carfentanil, ecstasy, and pills, she said. Fay has seen her friends make the “wrong choices” around the “wrong people” and end up in treatment, get out, relapsing, and ending up back in treatment. “Please pray for my community and the people in it, because every weekend, or even everyday people are partying and doing things that could easily hurt their future and themselves,” Fay said. Fay relies on her family and Ho-Chunk culture to keep herself positive. “I love my people and being Native American, because our language and traditions are beautiful things to learn and be a part of,” Fay said. Fay ended with an inspirational thought. “Our community is capable of so much more if we all work together to save, help, and love another,” Fay said. Larry Littlegeorge represented information about the Doctrine of Discovery, a papal bull, or a public decree or charter, issued by a Pope Nicholas V in 1452. The ideas found in this papal document were later woven into U.S. Indian law and, even today, is a shadow guiding the U.S. Indian policy, he said. “Thus began the European assumption that the Native people of the hemisphere didn’t own the land they called their own, because there were not Christians,” Littlegeorge said. We are grounded more than ever in our ways, he said. In closing, Littlegeorge shared 1 Corinthians 9:19-23. “To the Jews I became like a Jew, to win the Jew. “To those under the law I became like one under the law (though I myself am not under the law), so as to win those under the law. “To those not having the law I became like one not having the law (though I am not free from God’s law but am under Christ’s law), so as to win those not having law. Hattie Walker shared some of the church’s history. Walker is a long time member of the United Church of Christ, whose family were among the church’s first Ho-Chunk members. Walker’s grandfather, her two uncles, my mother, my aunt, and two of their cousins were the first members of the Ho-Chunk United Church of Christ. “As some of you know, our church has been in existence for a long time,” Walker said. Walker shared a story of how the Missionaries decided to come to Ho-Chunk territory. “Back in the 1800s, a gentleman got lost during a winter storm. You know our Wisconsin winter storms came be pretty wicked. But he got lost and some American Indians found him and brought him back to health. He was almost dead. They let him go and he was able to travel back to where he came from. Upon his return, he vowed to send some Missionary to help the Indians who helped him, she said. “In 1858 is when the Missionaries came to our area. One of our Ho-Chunk became a lay pastor, his name was John Stacy,” Walker said. 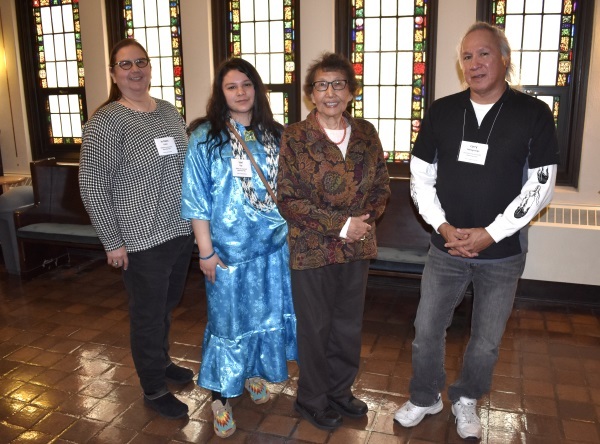 The Wisconsin Conference held the church property in trust, but in 2014, our Ho-Chunk United Church of Christ assumed responsibility of our church and the 17-acre property, she said. “The church welcomes all; the congregation consists primarily of members of the Ho-Chunk Nation. It has long served as the center of the community, at various times providing social support,” Walker said. JoDeen Lowe presented information on Ho-Chunk history. “Good afternoon, everyone. Brothers and sisters, it’s a privilege to be here. My colleagues and I want to give you a picture of our encounters and our origins,” Lowe said. Ho-Chunk people had always been knows as good traders. They had access to timber, lead, and copper, which helped early colonies grow, she said. Trading with other tribes was also one of the strong suits of the Ho-Chunk people, and we continue to do that today. You’re probably more familiar with some of our more modern trading mechanisms, which include our convenience stores, our casinos and hotels,” Lowe said. We invite you all to our church, she said.